Organisms vary greatly in the GC (guanine plus cytosine) content of their DNA, and yet all organisms can still make ribosomal proteins, DNA and RNA polymerases, and the various other essential proteins of life, no matter what their DNA vocabulary limitations might be. A high-GC organism like Streptomyces can make a given enzyme (DNA polymerase, say) using mostly G and C bases in its DNA, but a low-GC organism like Clostridium botulinum can also make the same kind of enzyme, even though it uses mostly A and T in its DNA. How is this possible? It's possible in part because of the many synonyms for amino acids available in the genetic code. But it's a mistake to think the same amino acids are used in equal numbers by high-GC organisms and low-GC organisms. Organisms at opposite ends of the GC spectrum use different amino acids. TABLE 1. Correlation (r) between amino acid usage and genome GC content (N=109 organisms). If you were to extract all the amino acids out of Clostridium botulinum (28% GC), you would get far more lysine than alanine. Conversely, if you were to hydrolyze all the proteins in Streptomyces griseus (GC 72%), you would find far more alanine than lysine. 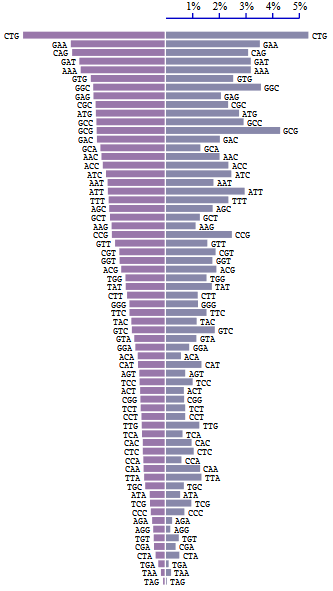 Interestingly, serine has six synonymous codons (AGT, AGC, CTA, CTG, CTC, CTT) and can just as easily be specified with G and C as with A and T; so overall, you'd expect little correlation with genomic GC. And yet serine use correlates strongly with low GC. In a sense, this is not surprising. Certain low-GC organisms (like Streptococcus) are known to produce serine-rich cell-coat proteins, some of which are important determinants of pathogenicity. But it may simply be that the high utilization of serine in low-GC organisms is related to one-carbon chemistry. Serine, after all, is the source of the methyl group that, by way of methylenetetrahydrofolate, converts dUMP to TMP (thymidine monophosphate, a DNA precursor). Any organism whose DNA is unusually rich in thymine (low in GC) will almost certainly be processing large quantities of serine. Serine is also a carbon source in the biosynthetic pathways for cysteine and methionine, both of which, like serine itself, are negatively correlated with genomic GC content. An interesting and somewhat mysterious aspect of biodiversity is that the relative proportions of the bases in DNA can take on wildly different values in different organisms even though they're making many of the same proteins. I'm referring to the fact that the G+C (guanine plus cytosine) content of DNA can vary from more than 70% (e.g., Streptomyces species) to less than 30% for certain bacterial endosymbionts (and even for some free-living bacteria, such as Clostridium botulinum). Remarkably, the DNA of the tiny bacterium Buchnera aphidicola (which is distantly related to E. coli but entered into a symbiotic partnership with the aphid around 200 million years ago) has a GC content of only 26%, making its DNA look almost like a two-letter code (A and T, with the occasional G or C). Many genome-reduced endosymbionts have lost most of their DNA repair enzymes (this is true of mitochondria, incidentally, which are thought to have arisen from a symbiosis with an ancient ancestor of today's Alphabproteobacteria), and this loss of repair capability could well explain much of the GC-to-AT shift seen in endosymbiont genomes. (Left on its own, DNA tends to accumulate 8-oxo-guanine residues, which incorrectly pair with thymine and result in GC-to-TA transversions at DNA replication time.) Whatever the cause(s), GC reduction has left many organisms with severely A- and T-enriched DNA. But the organisms in question are still able to encode perfectly functional proteins, even with a limited nucleic-acid vocabulary. I decided it might be interesting to try to visualize "GC diversity" by creating a heat map of G and C (in hot colors) and A and T (in cool colors) for certain genes that occur across all bacteria. For example, the following graphic is a heat map of GC and AT usage in the gene for thymidine kinase as it occurs in 61 different organisms with genomic G+C ranging from just over 70% to just under 30%. To create this map, I obtained DNA sequences for thymidine kinase from 61 organisms (using the excellent online tools at UniProt.org and genomevolution.org), then aligned them in MEGA6 and drew colors (red or red-orange for G or C, blue or blue-green for A or T) corresponding to the bases, using the Canvas API. What you're looking at are 61 rows of data (one row per gene; which is also to say, per organism). Gaps created during alignment are shown in grey. Several things are apparent from this graphic, aside from the obvious fact that GC usage (indicated by red and orange) tends to be high in the genes for organisms like Brachybacterium faecium (top line, GC 72%) and low for bottom-of-the-chart organisms like Clostridium perfringens B strain ATCC 3626 (28.7% GC) and Ureaplasma urealyticum (25.9%). 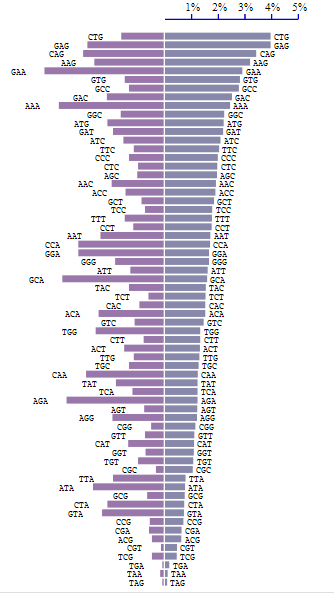 First, high-GC genes tend to be somewhat longer. (Indeed, in the upper right you can see that the longest genes opened up a sizable alignment gap that extends down the whole graphic.) Also, the genes differ substantially in their leader and trailer sequences, although I think what we're really seeing here is (at least in part) inaccurate annotation of start and stop codons. What's interesting to me is the way certain GC regions trail all the way down to the bottom of the graph while others fade to blue. I think it could be argued that the nucleotides represented by the red blips in the final few lines of the graph, at the bottom, are positions in the gene that are under strong functional constraints. It would be interesting to test those positions for evidence of selection pressure. It could be argued that all areas of low selection pressure have turned blue by the time you get to the bottom of the graph. Getting this many genes (from such divergent sources) to align is not easy. You can do it, though, by setting the gap-open penalty in ClustalW to a low value and aligning genes in small batches, row by row, if need be. As a technical aside: I first tried creating this graph using SVG (Scalable Vector Graphics), but the burden of creating a separate DOM node for every pixel (which is what it amounts to) was way too much for the browser to handle (Firefox choked, as did Chrome), so I quickly switched to the Canvas API, which puts no heavy DOM burdens on the browser and can convert a FASTA-formatted alignment file to a nice picture in about two seconds. One of many hotly debated topics in evolutionary biology is how codon usage bias (preference of an organism for certain codons, when other, synonymous variants are available) relates to transfer-RNA abundance. It's clear the two are related; no one disagrees on that. The question is whether codon usage bias is an outcome of tRNA abundance ratios, or the reverse. Genomic islands are part of the flexible bacterial gene pool and are somewhere between 10 and 100 kilobases (kb) in length. They frequently harbor phage- and/or plasmid-derived sequences, including transfer genes or integrases and IS elements. These particular blocks of DNA are most often inserted into tRNA genes and may be unstable. (Emphasis added.) Transfer RNAs are constantly being "inserted into" (and next to, not always into) by mobile elements, a phenomenon that's been well studied not only in bacteria but in yeast and elsewhere. Over evolutionary timespans, tRNA genes are duplicated, then disrupted, over and over again, by mobile DNA elements. These elements (whether from phages, viruses, transposons, or what have you) are known to have played (and continue to play) a significant role in shaping genome diversity, across all taxa. This is not a trivial factor, in other words. Transfer RNA genes are insertion hotspots. Surely the patterns of tRNA disruption caused by gene-hopping, over the eons, cannot be unimportant in the determination of codon usage patterns. Many examples can be found of ancient tRNA signatures inside the tail ends of protein genes, no doubt leftovers from millions of years of insertion events. 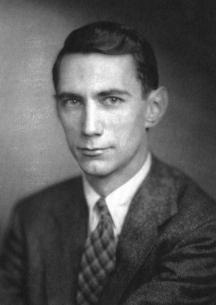 Claude Shannon made an important finding when he realized that the information contribution of a symbol could be estimated very simply as -f(x) log(f(x)), where f(x) is the frequency of occurrence of the symbol x. For example, a series of a coin tosses can be considered a binary information stream with symbol values H and T (heads and tails). If the frequency of H is 0.5 and f(T) is 0.5, the entropy E, in bits per toss, is -0.5 times log (base 2) 0.5 for heads, and a similar value for tails. The values add up (in this case) to 1.0. The intuitive meaning of 1.0 (the Shannon entropy) is that a single coin toss conveys 1.0 bit of information. Contrast this with the situation that prevails when using a "weighted" or unfair penny that lands heads-up 70% of the time. We know intuitively that tossing such a coin will produce less information because we can predict the outcome (heads), to a degree. Something that's predictable is uninformative. Shannon's equation gives -0.7 times log(0.7) = 0.3602 for heads and -0.3 * log (0.3) = 0.5211 for tails, for an entropy of 0.8813 bits per toss. In this case we can say that a toss is 11.87% redundant. DNA is an information stream resembling a series of four-sided-coin tosses, where the "coin" can land with values of A, T, G, or C. In some organisms, the four bases occur with equal rates (25% each), in which case the DNA has a Shannon entropy of 2.0 bits per base (which makes sense, in that a base can encode one of 22 possible values). But what about organisms in which the bases occur with unequal frequencies? For example, we know that many organisms have DNA with G+C content quite a bit less than (or in some cases more than) 50%. The information content of the DNA will be less than 2 bits per base in such cases. These numbers are for a single strand (the coding strand or "message" strand) of DNA, which is why A and T aren't equal. For whole DNA, of course, A =T and G = C, but that's not the case here. We're just interested in the message strand. If we put the above base frequencies into the Shannon equation, we come up with a value of 1.8467 for the information content (in bits) of one base of C. botulinum DNA. The DNA is about 7.67% redundant on a zero-order entropy basis. The DNA may be over 70% A and T, but it's a long way from being a two-base (one bit) information stream. Each base encodes an average of 1.8467 bits of information, which is a surprising amount (surprisingly close to 2.0) for such a skewed alphabet. 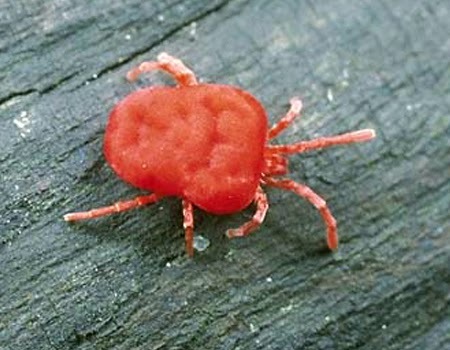 If you've ever been bitten by tiny red bugs in the garden, you're familiar with members of the Trombiculidae, a family of mites known variously as berry bugs, harvest mites, red bugs, scrub-itch mites, aoutas, or (in the southern U.S.) "chiggers." In the United States., the garden-variety chigger is basically harmless, but in much of the world this tiny arthropod comes with a very nasty endosymbiont known as Orientia tsutsugamushi, which is a bacterium related to the Rickettsia organisms that cause various tick-borne diseases. Throughout much of the Orient, O. tsutsugamushi infections (from chigger bites) cause scrub typhus, which begins with a rash and fever but can progress to a cough, intestinal distress, swelling of the spleen, abnormal liver chemistry, and ultimately pneumonitis, encephalitis, and/or myocarditis and even death. Treatment with doxycycline, azithromycin, or chloramphenicol is usually successful. typhus, although U.S varieties are typically harmless. The sequenced genome for O. tsutsugamushi is available, and if you go to this link and click on "Click for features" at the bottom of the Dataset Information box you should be able to open up a table that shows the organism as having 1,182 protein-coding genes (quite a small number), plus an additional 1,994 pseudogenes (quite a huge number, by comparison). The "DNA Seqs" links in the table will let you download the DNA sequences of all the organism's genes and pseudogenes. This is an extremely unusual situation, in that we're dealing with a bacterium that has more pseudogenes (switched-off, defunct, damaged genes) than regular genes, something that can be said of no other bacterium of which I'm aware. The leprosy bacterium (Mycobacterium leprae) is famed for having approximately 1100 pseudogenes and 1604 "normal" genes. Astonishingly, Orientia tsutsugamushi reverses that ratio, and then some. We don't know for sure how old Orientia tsutsugamushi's pseudogenes are. A standard rule of thumb in biology is that microbial genomes experience one spontaneous mutation per chromosome per 300 generations. But this doesn't really help us decide how old Orientia's pseudogenes are, since the pseudogenes probably didn't arise one by one, indepedently, through accumulation of random mutations. More than likely, a massive pseudogenization event caused the simultaneous deactivation of a large, unknown number of the organism's genes (of which 1100 survive today as pseudogenes), much the same as has been hypothesized for M. leprae. We have good reason to believe M. leprae's pseudogenes are at least 9 million years old. It seems likely that the pseudogenes in Orientia are also quite old, or at least not terribly new. To get more perspective on this, I analyzed Orientia's pseudogenes from a couple of perspectives. What I found, first of all, is that the pseudogenes are shorter than their non-pseudo counterparts, averaging 700 bases in length (versus 879 for normal genes). This is similar to the case with M. leprae (where pseudogenes are 795 bases long and normal genes average 1,098). The average shorter gene length for Orientia vis-a-vis M. leprae is consistent with the fact that this is a greatly gene-reduced low-GC (30.5%) endosymbiont, whereas the Mycobacterium family is (in theory) free-living, with higher GC content (57.8% for M. leprae; 65% or more for tuberculosis species). Purine usage in base one of codons in Orientia tsutsugamushi (N=346,326 codons). No pseudogenes were included in this graph. See the next graph (below) for pseudogenes. This graph leaves little doubt that most codons begin with a purine (A or G). The median AG1 value is 63.8%. Very few proteins lie to the left of x=0.50, and frankly some of those are probably misannotated as to reading frame. 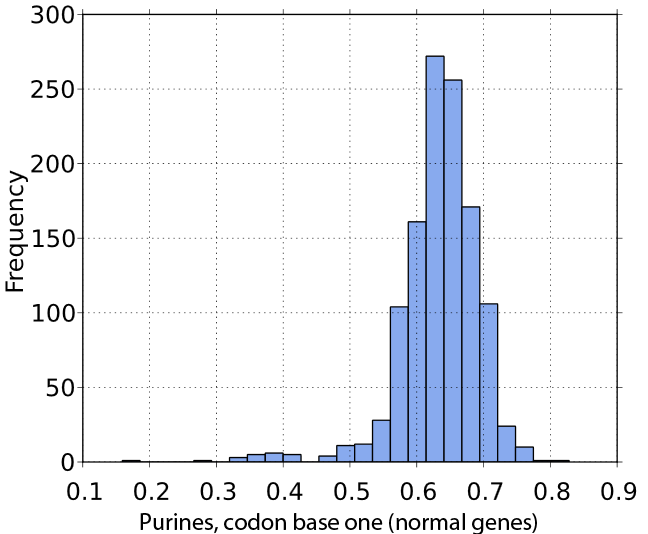 Purines in codon base one (AG1) of pseudogenes (N=462,933 codons) in Orientia. 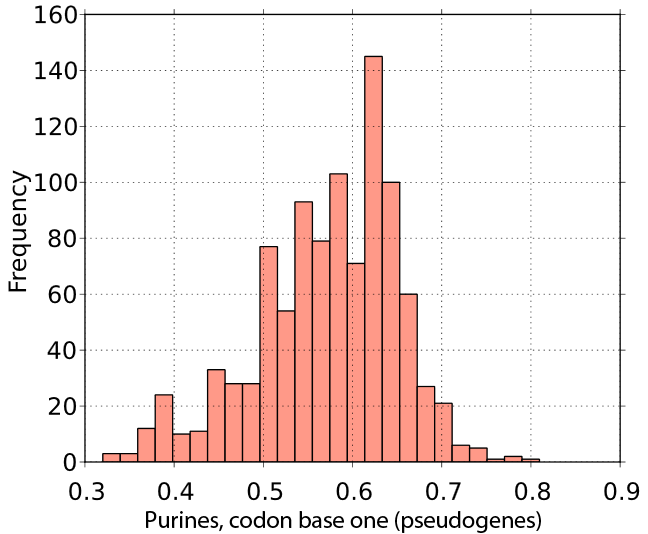 Here we see that purine usage in codon base one is not as strong (median 58.4%), although clearly, plenty of codons still show AG1 above 60%, implying that many pseudogenes are still "in frame" (not frameshifted). Interestingly, AG1 is not only higher in normal-gene codons than in pseudogene codons, it's also higher in codons associated with proteins of known function than for "hypothetical protein" genes. Only 41.3% of pseudogene codons have AG1 greater than 60%, whereas 66.7% of "hypothetical protein" genes have AG1 > 60% and 84.3% of genes with functional assignments have codon AG1 greater than 60%. This implies that some genes annotated as hypothetical proteins may, in reality, be pseudogenes that are incorrectly annotated. I'll return to that topic some other time. In 1964, Emile Zuckerkandl and Linus Pauling wrote a paper (published the following year) for the Journal of Theoretical Biology suggesting the use of amino-acid and nucleic-acid sequences for deducing phylogenetic relationships. Ever since then, biologists have been trying to use sequence data to get to the root of the tree of life. Darwinian logic says that at some point, all cells had to have diverged from a Last Universal Common Ancestor (LUCA). Unfortunately, as pointed out by Doolittle and others, the quest for LUCA is greatly complicated by mutational saturation effects, reductive genome loss in important members of the most ancient taxa, convergent evolution, and non-negligible (yet difficult to estimate) amounts of horizontal gene transfer, among other serious problems. An evolutionary tree of life based on analysis of N=420 genomes of free-living organisms. Proteomes are taxa and protein fold superfamilies are character data. Adapted from Kim and Caetano-Anollés, BMC Evolutionary Biology (2011), 11:140. Click to enlarge. See text for discussion. Of the roughly 3100 COGs analyzed, only 80 were found to occur in all organisms. Fifty of these universally present genes showed the same phylogenetic relationships as rRNA. These disappointing results are understandable and perhaps expected, given the huge amount of deck-reshuffling that's happened in three billion years. It might well be that genome sequence data, with its constant churn, represents the wrong level of granularity for deep-phylogenetic studies. What matters for organisms, after all, is function, and function is an outcome of protein tertiary structure, not just primary structure. The minimum urancestral FSF set reveals the urancestor had advanced metabolic capabilities, was especially rich in nucleotide metabolism enzymes, had pathways for the biosynthesis of membrane sn1,2 glycerol ester and ether lipids, and had crucial elements of translation, including a primordial ribosome with protein synthesis capabilities. It lacked however fundamental functions, including transcription, processes for extracellular communication, and enzymes for deoxyribonucleotide synthesis. Proteomic history reveals the urancestor is closer to a simple progenote organism but harbors a rather complex set of modern molecular functions. The paper is quite long (14,700 words) and often relentlessly technical, but convincingly restores the quest for LUCA to the firm empirical grounding that such a quest seemed (for a while) to have been robbed of after Doolittle's "Uprooting the Tree of Life" and Dagan and Martin's "The Tree of One Percent." While parasitic microorganisms were found to occupy some of the most ancient branches of the superkingdom tree, Kim and Caetano-Anollés nevertheless decided to omit such organisms from their study since reductive evolution (wholesale loss of entire families of enzymes and their control systems) might otherwise queer the results. The final set of free-living organisms included 48 archaeal, 239 bacterial, and 133 eukaryotic members. To avoid potential problems with long-branch attraction, the researchers wisely sampled (at random) equal numbers of proteomes per superkingdom and replicated trees of proteomes, so that bacterial data (which of course predominated) wouldn't swamp archaea or eukaryota. The earliest start of organismal diversification occurred sometime between 2.91 and 2.03 billion years ago. Translation had metabolic origins. It appeared only after the emergence "of a large number of metabolic functions, but before enzymes necessary for the synthesis of DNA." Proteomic analysis of extant fold superfamilies (FSFs) showed that "over 200 additional FSFs are necessary in urancestral FSF sets to account for the complexity of the simplest organism in existence today." None of the domains present in ribonucleotide reductase (RDR) enzymes was present in the min_set (representing the LUCA lower bound of complexity). Further, "We note that the reduction of ribonucleotides to deoxyribonucleotides involves the production of an active site thiyl radical that requires contacts with cysteines in all protein domains of the catalytic subunit of the oligomeric enzymatic complex, suggesting modern ribonucleotide reductase functions is [sic] indeed derived." Commenting on the known active-site domain homology between class III ribonucleotide reductase and pyruvate formate lyase (a link proposed to have mediated the RNA-to-DNA biological transition), Kim and Caetano-Anollés point out that phylogenomic analysis at the fold-family level suggests the pyruvate formate-lyase domain emerged later than its ribonucleotide reductase counterpart. Therefore it's likely that the urancestor stored genetic information as RNA and not DNA. Kim and Caetano-Anollés note: "The urancestor had an advanced metabolic network, especially rich in nucleotide metabolism enzymes, had primordial pathways for the biosynthesis of membrane glycerol ether and ester lipids, crucial elements of translation, including amino-acyl tRNA synthases, regulatory factors, and a primordial ribosome with protein synthesis capabilities. It lacked however transcription and in advanced evolutionary stages stored genetic information in RNA (not DNA) molecules." The authors have many interesting things to say about the evolution of archaeal and bacterial membrane-lipid chemistry (and much else). If you're a biologist and you haven't yet read the Kim and Caetano-Anollés paper, do yourself favor and take a look at it now. It's a fascinating read, no matter what side of the LUCA fence you're on. Which Direction Does the Gene Point? A maddening problem in genome annotation is determining the "sense" strand for a gene, especially when the gene is short and/or the genome has a high GC content (and thus contains few or no stop codons in reverse translation). To convince yourself this is a very real and serious problem, all you have to do is browse a few genomes to see the ridiculously high number of "hypothetical proteins" (over 40% in some genomes), bogus overlaps, genes that score BLAST hits in reverse-complement mode but not frame zero, and other artifacts that are a direct result of the aforesaid problem. I've presented examples of this problem before, but just so there's no confusion, I want to show you a particularly maddening example so you can see what I'm talking about. (Then I'll suggest a solution.) The following graphic shows a region of E. coli UTI89 in which several genes are shown as overlapping (that is to say, existing on opposite strands of DNA in the same coverage area). Small overlaps sometimes happen between genes, but whole genes rarely, if ever, overlap, and never in clusters. The situation shown below is bogus, but you see it all the time in public genomes. In fact, some of the genes shown below also show up as overlaps in Mycobacterium abscessus M93 (see gene OUW_18941), Citrobacter koseri strain ATCC BAA-895 (gene CKO_00072), and quite a few others. Glimmer has choked on this exact situation many times, in many genomes. A region with overlapping genes in the genome of E. coli UTI89. The big gene on the top strand, middle, is UTI89_C4288 (DNA sequence here). It's annotated as (what else?) a "hypothetical protein." The M. abscessus version of the gene (here) is marked as a "cellobiose phosphorylase," and you can find many BLAST hits (the Rothia version gives an E-value of 6.0×10-101) for similar "cellobiose phosphorylase" genes in other organisms at UniProt.org and elsewhere. Of course, they're all bogus and represent Glimmer choke points, but the question is how one can determine that, and be sure about it. E. coli's hypothetical protein (UTI89_C4288) has a wobble-base GC percentage of 64.3%, whereas the gene on the opposite strand (just below it, pointing left), namely UTI89_C4287 (marked as "membrane-bound ATP synthase F1 sector alpha-subunit"), has GC3 = 54.5%. In a much higher-GC organism like Mycobacterium or Pseudomonas, you would find out which gene has the higher GC3 percentage and crown it the winner (and most of the time, you'd be right). In this case, it's not so simple. 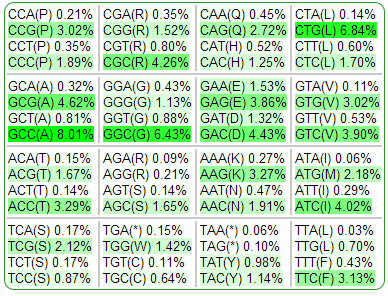 The gene with the higher GC3 value isn't necessarily the winner. Of course, in this particular example, you can cheat and look at the identities of the genes in the immediate vicinity of the hypothetical protein, on the bottom strand, and if you do, you'll find that all of the bottom-strand genes are ATPase subunits. Mystery solved, right? Sure, in this particular case. But what about situations where overlapping genes are all shown as "hypothetical protein"? (You can find many such cases in the genome for Burkholderia pseudomallei strain 1710b, for example.) When a hypothetical overlaps a hypothetical in a low-GC genome, then what? One of my favorite cheats (but this isn't the final solution!) is to check the gene's AG1 percentage (adenine plus guanine, codon base one). This percentage averages ~60% in something like 90% of protein-coding genes. The problem is, AG1 is often 60% whether you read the gene forward, or backward (off the antisense strand). The reverse complement of a gene usually has high AG1, because the forward AG3 is usually under 50%. Almost any trick you can dream up will fail under edge cases. GC3 is helpful, but only in high-GC genomes. AG1 is helpful, but only sometimes. Shine Dalgarno signals are not universally used by all organisms, and even in those that do use them, they're usually reserved for highly conserved genes encoding things like ribosomal proteins. Gene context is helpful in some cases but not others. It turns out, the best clue for positively identifying the correct strand and correct reading frame is codon usage frequency patterns. If you know what the codon frequencies are, genome-wide, for a given organism, you can use this information to good advantage, even if the genome (and therefore the codon table) contains inaccuracies. As long as the codon frequencies are approximately correct, you can use them to verify the reading frame of a protein-coding gene. The algorithm I came up with is very simple, yet effective. For a given gene, read each triplet of bases sequentially, and score each triplet twice: keep two scores going. First, score it according to its frequency in the codon table for the organism. Then score it according to a second table developed for reverse-complement codons. The following table shows codon frequencies in Caulobacter crescentus NA1000. If you were to encounter a "hypothetical protein" gene in Caulobacter, and you couldn't decide whether the strand assignment was correct or not, first develop a score for the gene by reading its triplets and adding the frequency value of the corresponding codon to the running total. For example, if you encounter the triplet "CTG," add 6.84 to the score (see table). For every occurrence of CTT, add 0.60, for CTC add 1.70, and so on, using the values in the table. Codon frequencies for Caulobacter crescentus NA1000. But you also have to create an anticodon frequency table as follows: For every codon in the original table, apply the same score to the corresponding reverse-complement codon in the "antcodon table." E.g., for CTG, the first table would contain 6.84 (as above), but the value 6.84 would apply to CAG (the reverse complement of CTG) in the second table. I call the first table the "forward" table and the second table the "back" table. 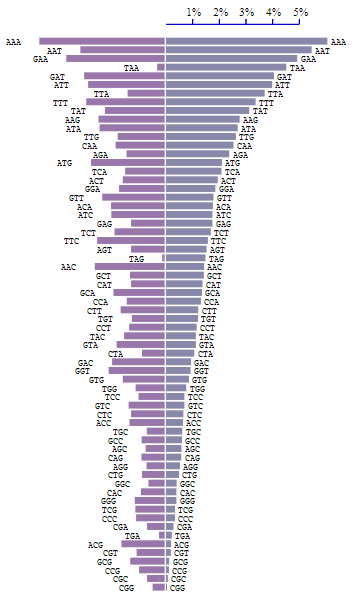 One represents the frequencies of codons encountered in protein genes in the forward reading direction. The other represents those same frequencies applied to the reverse-complement of the codons (the same codons read in the reverse direction, off the opposite DNA strand). When scoring an unknown gene, you tally a "forward table" score, and keep a separate score using the "back" table. When you're done, the gene's "forward table" score should be greater than the "back table" score. If it's not, you're reading the gene off the wrong strand. When I scored all 3,737 C. crescentus CB15 genes using this technique, I found 136 genes that gave a "back" score higher than the "forward" score. Interestingly, when I checked the identities of those 136 putative "backwards-annotated" genes, 132 of them were listed as "hypothetical proteins." Only four genes with assigned functions gave suspect scores, and one of those (CC_0662) turns out to be a 100%-identity match for the reverse of gene CCNA_00700 in Caulobacter crescenstus NA1000. The other three are less than 200 bases long and could well be non-coding regions. For a more challenging test, I turned to the genome of Rothia mucilaginosa DY-18, one of the most disastrous annotation nightmares of all time. In the genome for DY-18 you will find 524 protein-coding genes (out of 1,905 total) that are involved in significant overlaps. (Some overlaps are 2-on-1, some are 1-on-1; but the genome is almost certainly overannotated by at least 260 genes.) I trained my program on the codon usage table of R. mucilaginosa M508 (which contains fewer overlaps than DY-18), then tallied codon and anticodon scores on all of DY-18's CDS genes. In the end, 276 genes gave scores indicative of a reversed reading frame. Of those, 265 were, in fact, involved in overlaps. Codon scoring is such an effective method, I don't know why programs like Glimmer don't use it. It's quite obvious they're not using it, though, because every genome has reverse-annotated genes (by the hundreds, in some cases) that are easily detected using this simple method. For "budget reasons" (supposedly), the Joint Genome Institute now requires all users to be registered and approved before they can use the (taxpayer-funded) https://img.jgi.doe.gov site. Fortunately, my registration was approved and I can use the excellent online genomics tools there, one of which produced the following table of Top Ten Organisms by Pseudogene Count. Again: Don't expect the above links to work if you're not a registered JGI user. (I don't know if they will work for you or not.) This list was automagically generated by the Department of Energy's Joint Genomes Institute and I thought you might get the same kick out of it that I got. It's eye-opening to see the ratio of pseudogenes to "normal" genes in these organisms. Isn't it? Taking the top three spots are mouse, rat, and humans. (Note: These counts should be taken with a bit of caution, as some have estimated the number of pseudogenes in the human genome to be much higher than the 7,186 shown here.) All the other spots in the chart except Arabidopsis (which is a leafy plant) are bacteria. The leprosy bacterium, which I've written about before, comes in tenth place. Personally, I believe pseudogenes are as much a feature of DNA as regular genes; certainly in higher life forms, they occur in great numbers. The vast majority of bacterial genomes in public databases are shown as having no pseudogenes. I find that (how shall I say?) not at all credible. Some day it will be obvious that almost every genome harbors pseudogenes; we simply lack smart enough software to detect them all right now. It's generally conceded that viruses evolve more rapidly than host cells, but the rates vary tremendously depending on the type of virus. Generally, large DNA viruses that infect algae (the phycodnavirus family) are considered to have some of the slowest rates of change, whereas the fastest-to-change viruses tend to be small RNA viruses that infect animal cells (e.g., HIV). In terms of substitutions per nucleotide per cell infection (s/n/c), one recent study found rates of 10−8 to 10−6 s/n/c for DNA viruses and 10−6 to 10−4 s/n/c for RNA viruses, which means the fastest-mutating viruses change 10,000 times faster than the slowest-mutating viruses. Given the ultra-rapid rate of change of RNA viruses and their generally impressive level of adaptation to host-cell environments, one might expect a virus like HIV-2 to show a codon usage bias similar to that of the host. And that's approximately true. 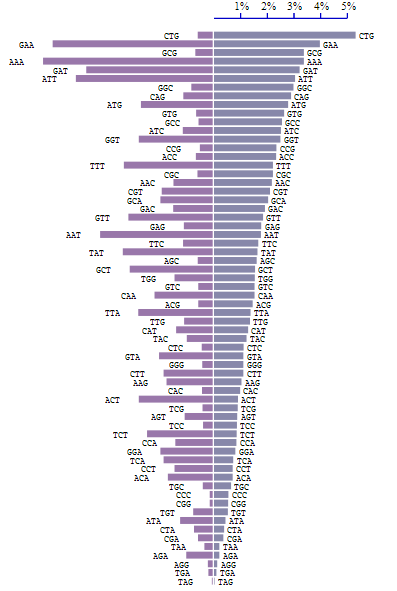 HIV-2 codon usage (left), in DNA format (T for U), versus overall human-cell codon usage (right). The above graph shows codon usage for HIV-2 on the left and codon usage for human cells on the right. (HIV is an RNA virus, but codons are shown here in DNA format, with T in place of U.) R-squared/adjusted comes to 0.2204, so we can't very well say confidently that the codon values are highly correlated. 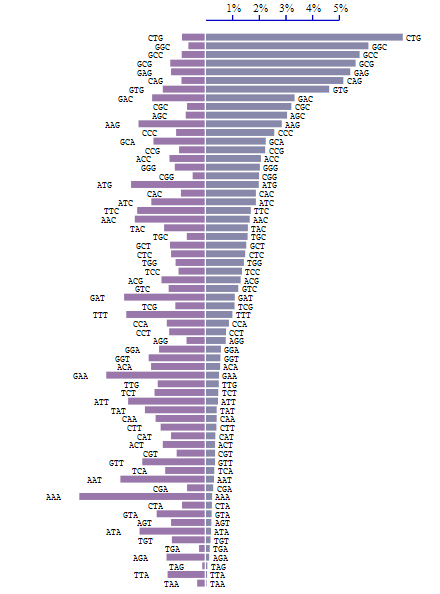 But if you look at the smaller bars (not the "peaky" ones), they tend to taper down on the left, just as on the right. Codon usage in Paramecium bursaria Chlorella virus 1 (PBCV-1), left, and Chlorella variabilis strain NC64A, right. These two data sets are not only not correlated, they appear to be anticorrelated, which is quite unexpected. Bear in mind, PBCV-1 is relatively large, with a genome of 330,601 base pairs encoding hundreds of proteins (and ten tRNAs). Thus the pattern shown here isn't likely to be random noise. Note that PBCV-1 has a genomic G+C content of 40%, versus 61% for the host, which is a pretty sizable separation. It's almost as if PBCV-1 has spent part of its life coexisting with an entirely different host. Which brings me to the final and most intriguing (I might even say shocking) graphic, which compares codon usage in PBCV-1 virus with codon usage in Chlorella's own host, Paramecium. Codon usage in PBCV-1 virus (left) and Paramecium (right). 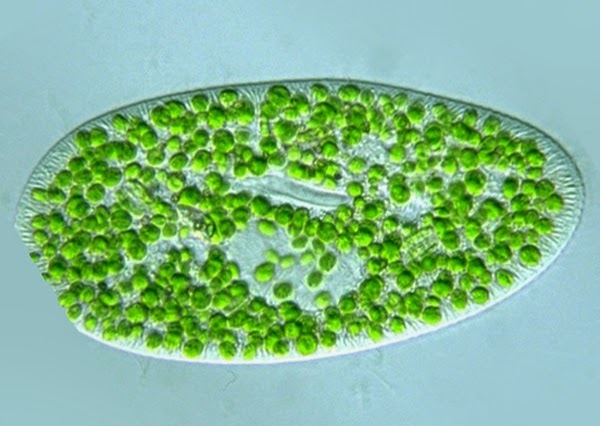 Paramecium filled with Chlorella cells. This chart is a real shocker from a couple of standpoints. First, as I say, PBCV-1 virus is not known to infect Paramecium. And yet codon usage patterns in the virus are much more closely aligned to Paramecium's patterns than to Chlorella's. Notice that AAA is the No. 1 most-used codon in PBCV-1 as well as Paramecium. Seven of Paramecium's top ten codons are in PBCV-1's top ten. Secondly, Paramecium doesn't use the standard genetic code! It uses the Ciliate Code (Translation Table 6), in which TAA and TAG encode glutamine instead of serving as stop codons. (TGA is the one and only stop codon in Table 6.) If Paramecium used the standard genetic code, the alignment of the two organisms would be even stronger. Also interesting is that PBCV-1 and Paramecium are quite far apart in G+C content (the former is 40%, the latter is 28%). Perhaps at some point in its past, PBCV-1 had a wider host range, one that included Paramecium. It's possible that even today, it has hosts other than Chlorella that have yet to be observed experimentally. Certainly, the pattern of codon usage is consistent with such an idea. There's a school of thought that says that viruses originated as escaped constellations of host genes. Virus genes have to originate from somewhere. One theory is that they started with host genes. Trouble is, there's precious little evidence that viral genes originated from host genes, and plenty of evidence to the contrary. It may actually be that host genes came from viruses. To say viral genes derive from host genes is like saying hemorrhoids derive from earlobes. Any resemblance is, at best, superficial. In a previous post, I showed data for the relatively large phylogenetic distance between thymidine kinase genes in phages (viruses that attack bacteria) and their hosts. In one case, I showed that prophage genes (genes from viruses that have succeeded in integrating into the host DNA) are more similar to host genes than lytic-lifestyle phages, but even in the case of temperate phages, I think we have to be honest and say that a prophage is still an example of foreign DNA integrating into a host. (Prophage genes can usually be easily identified by their base composition, which differs noticeably from the base composition of host genes.) Once a prophage becomes fully integrated into the host, its DNA (under the influence of the host repairosome) will tend to ameliorate, taking on the base composition and other characteristics of the host DNA, making it superficially similar to host DNA. What "other characteristics" does ameliorated DNA take on? Consider codon usage patterns. Recall that the genetic code is set up in such a way that most amino acids correspond to more than one codon (three-letter pattern) in the DNA. Leucine, for example, can be encoded six different ways (namely by base patterns CTA, CTG, CTT, CTC, TTA, and TTG). Likewise, alanine can be encoded four ways (GCA, GCG, GCT, or GCC). But specific organisms develop specific patterns of codon use, preferring certain synonyms over others. For example, Clostridium botulinum (the food-poisoning bug) overwhelmingly prefers to use TTA for leucine (rarely using the other 5 synonyms), whereas E. coli strongly prefers to use CTG (choosing it four-to-one over the next-most-used leucine codon). These codon preference patterns are highly specific to a given species and are thought to be related to the numbers and types of available transfer RNAs (tRNA) in the cell, although frankly it's still an open question whether codon usage adapted to tRNA availability or the reverse. The idea that viruses mutate rapidly and evolve in close harmony with the hosts on which their reproduction depends suggests that virus codon preferences should match those of the host. (This would be particularly true if virus genes come from host genes.) Remember that a virus has no ribosomal machinery and must rely on the host's protein-making equipment in order to survive. Therefore it would make sense for a virus to adapt its codon usage patterns to the patterns most favored by the host equipment. Codon usage frequencies for T4 phage (left) and E. coli B (right). In this graphic, host-cell codon usage frequencies are on the right while corresponding T4 virus frequencies are on the left. Note that the T4 chromosome encodes 274 protein genes, encompassing over 50,000 codons, so the graphic is based on fairly solid numbers; variations from E. coli can't be accounted for simply by statistical noise. T4's codon preferences are so different from the host cell's, the T4 phage brings with it genes for 8 types of tRNA. But the differences in codon usage go well beyond 8 codons, so the presence of tRNA genes in T4 DNA doesn't, by itself, explain the divergence of the data. Codon usage in Fels-2 phage (left) and Salmonella typhimurium LT2 (right). Here, we see that the codon usage patterns of Fels-2 and its host are quite similar. The differences are easily accounted for by the fact that Fels-2 has only 47 protein-coding genes, and the amino acid composition of those genes is probably different enough from "average" host genes to sway the usage stats to the degree shown here. Nevertheless, codon usage patterns aren't sufficient to tell us where Fels-2 genes came from originally. That's still an open question. Like the Martians in War of the Worlds, Fels-2 genes probably came from "somewhere else." Robbie: "What, you mean, like Europe?" Tom Cruise character: "No, Robbie. Not like Europe." Prophage genes are seen in a wide variety of bacteria (a 2008 paper estimated that over 60% of bacterial genomes contain prophage genes), and in fact human DNA is thought to contain at least 8% retroviral gene remnants. There's reason to suspect that certain large DNA animal viruses (such as herpes and vaccinia) have a lysogenic cycle. Certainly, viruses like varicella zoster (which can produce shingles many years after a person's initial infection) can remain dormant for decades before suddenly undergoing induction to a lytic phase. Viruses that live an exclusively lytic lifecycle have relatively few opportunities to co-evolve with the host, because they spend little time in the host. Such a virus might spend years "hanging around" in the environment before encountering a host cell; then the lytic reproductive cycle may last only minutes or hours, and it's back to "hanging around" in the environment. The situation is much different for a temperate virus (i.e., one that has a lysogenic cycle). A lysogenic virus essentially becomes an integral, first-class component of the host DNA and undergoes the same replication and repair processes that apply to host DNA. Accordingly, we should expect to see a much different pattern of evolution in the genes of lysogenic viruses (or prophages). And indeed we do. DNA adenine methylase genes from three enteric bacteria and two phages (marked with asterisks). 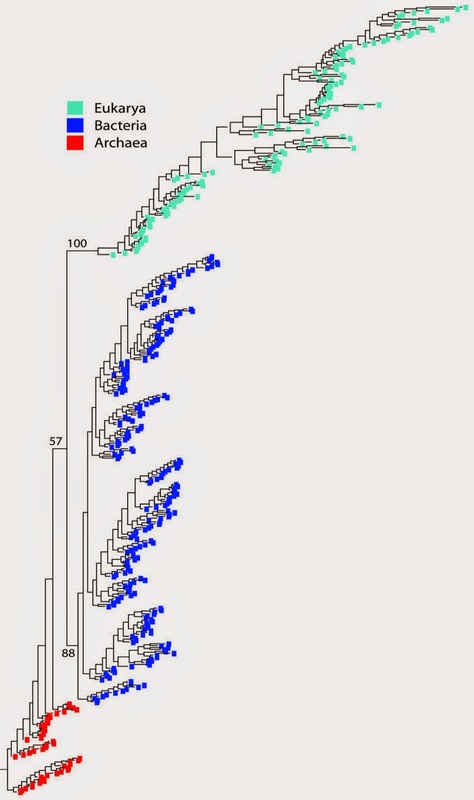 The top branch shows very close homology between prophage genes and their bacterial paralogues. The bottom branch shows that the native bacterial isoform of the enzyme is not as closely related to the prophage version(s). With the dam genes, we see an interesting segregation pattern. There are two main branches to the phylo-tree. In the upper branch are the phage dam genes along with bacterial paralogues of these genes. The bottom branch shows how the non-paralogous (non-prophage) dam genes segregate. To make these relationships clearer, here's a chart showing the overall G+C content as well as the GC3 (G+C content at codon base 3) for the various genes. The entries shaded in grey represent prophage genes. Notice that the G+C percentages are significantly lower for the prophage genes, but are higher than in free-living lytic-cycle phages (where GC3, in particular, is often less than 20%). DNA adenine methylase genes for enteric bacteria and their temperate phages. Base-composition stats for prophage isoforms are shown in grey. If you compare the phylo tree shown further above with the phylo tree in my earlier post about thymidine kinase genes, you'll note that the prophage dam genes cluster very tightly with bacterial versions of these genes. That's because, as a fully integrated part of the genome, the prophage genes benefit from the host's DNA repairosome. They evolve gradually over long periods of time by the usual mechanisms. The genes are notably host-like because they're continuously repaired and groomed in the same manner as host DNA. The takeaway here is: If you create a phylo-tree for a set of genes from hosts and viruses, and the genes cluster tightly with host versions, you're probably looking at the result of longterm lysogeny. On the other hand, if the virus genes do not cluster with host genes (as they usually don't! ), that means you're looking at viruses that have a predominantly lytic mode of existence; viruses that probably got their genes from a far-distant ancestor of the modern-day host, if not from a primordial precellular precursor of some kind. Some viral genes show evidence of having an ancient origin, predating the divergence of host organisms into different species. The enzyme thymidine kinase (TK), for example, has followed a certain set of evolutionary paths in enteric bacteria: the E. coli version differs slightly from the Salmonella version, which differs from the Yersinia version or the Shigella version, but they all show show evidence of common descent from ancestors that included Vibrio and Proteus. By contrast, the bacteriophages (viruses that attack enteric bacteria) have their own thymidine kinases that followed different evolutionary trajectories, resulting in genes with quite different G+C contents. The thymdine kinase in today's T4 phage shows a closer phylogenetic relation to the TK of Rhizobium and Agrobacterium than to E. coli or Salmonella. I presented a phylogenetic tree to this effect in an earlier post. But sometimes, viral genes follow host-gene evolution more closely. The thymidine kinases of eukaryotic organisms and their viruses provided a good example of this. Consider the following tree developed from thymidine kinase genes of Guinea pig (Cavia porcellus), bull (Bos taurus), Cowpox and Swinepox viruses, amoeba species (Entamoeba), amoeba Mimivirus, two algal viruses, and finally, two strains of the alga Micromonas. Thymidine kinase genes for cowpox and swinepox viruses occur in the same sub-branch with bull (Bos taurus) and Guinea pig (Cavia porcellus) genes; see the top four lines. Likewise, the Mimivirus TK gene is not far from Entamoeba. and the TK genes for algal viruses cluster near the TK genes of the alga Micromonas. Branch confidence is high (after 500 bootstraps, no nodes separate with less than 67% confidence). The 0.1 scale marker (lower left) represents substitutions per site, as represented by leaf-node depth. Tree generated using Mega6 freeware. If you're not familiar with interpreting these trees, node depth (horizontal line length) is proportional to the fraction of amino acid substitutions per site, with a line length of about a centimeter representing 10 substitutions per 100 amino acids (note the 0.1 marker, lower left). The numbers at the branch points (100, 91, 86, etc.) represent the confidence that nodes to the right were located in the proper branches. These numbers are perecntages, representing the number of bootstrap trials (out of 100) that resulted in no "node-jumping." (Bootstrap testing is a way of introducing systematic noise into sequences to try to "trick them" into jumping to a new spot in the tree. If a little noise makes a node switch locations, the original location is suspect.) Every node in this tree was tested with 500 bootstrap tests. Overall, we can be fairly certain the node locations are correct. What does the tree mean? Unlike the situation with bacterial and bacteriophage kinases (see earlier post), the various thymidine kinases of the DNA viruses shown here do tend to evolve in parallel with host equivalents. However, this doesn't automatically mean the viral genes originated with host genes, because (for example) the amoeba version of thymidine kinase shares only 39% amino-acid sequence identity with the Mimivirus version. That's a lot of divergence. It means the viral version of the gene (no doubt highly optimized for viral needs) could have come from a very-long-ago ancestor of the present-day host. Likewise, the Bos taurus version of the TK gene has only 69% similarity with the cowpox version. By comparison, the bovine gene is 88% similar to the human gene. The cowpox thymidine kinase gene is further away (evolutionarily) from the host gene than human TK is from rainbow trout TK. It's prudent to conclude that viral genes are not simply orthologues of host-gene counterparts; they certainly don't represent recent gene transfer events (because there's way too much sequence divergence, even accounting for faster evolution in DNA viruses than in host DNA). The viral genes come from "somewhere else," probably a primordial past. Any resemblance to present-day host genes is largely incidental. The great majority of so-called "virus hallmark genes" (involving things like capsid proteins) have no counterpart at all in modern host cells, with very rare exceptions. Large DNA viruses may have gotten their start a long, long time ago, possibly in the pre-cellular world, where communities of free-ranging genes (some "selfish," some less so) coexisted in a common broth, with the only "cells" being micro-compartments in ocean-bed minerals. The existence of several genes that are central to virus replication and structure, are shared by a broad variety of viruses but are missing from cellular genomes (virus hallmark genes) suggests the model of an ancient virus world, a flow of virus-specific genes that went uninterrupted from the precellular stage of life's evolution to this day. This concept is tightly linked to two key conjectures on evolution of cells: existence of a complex, precellular, compartmentalized but extensively mixing and recombining pool of genes, and origin of the eukaryotic cell by archaeo-bacterial fusion. The virus world concept and these models of major transitions in the evolution of cells provide complementary pieces of an emerging coherent picture of life's history. Where Do Virus Genes Come From?